NDT (Non Destructive Testing) and other NDT services are a wide group of analysis techniques used to evaluate the properties of a material, component or system without causing any change to the structure or chemical composition of the part being tested. By not permanently altering the component being inspected, NDT provides a highly valuable technique that can save both money and time in product testing and evaluation, troubleshooting and research. Amfin’s internal Metallurgical laboratory carries out a number of specialised processes in a dedicated area. These include hardness testing, sample preparation and microscopic assessment, both software based analysis tools and foreign object determinations (FOD) in a separate clean room. After chemical etching, Metallurgical inspection of critical and sensitive rotating components is carried out and is a vital process prior to assembly in the aircraft engine. Amfin has installed an efficient conveyer based Fluorescent Penetrant Inspection (FPI) System. This allows for a repeatable and reliable processing route, supported by our highly trained and experienced staff. 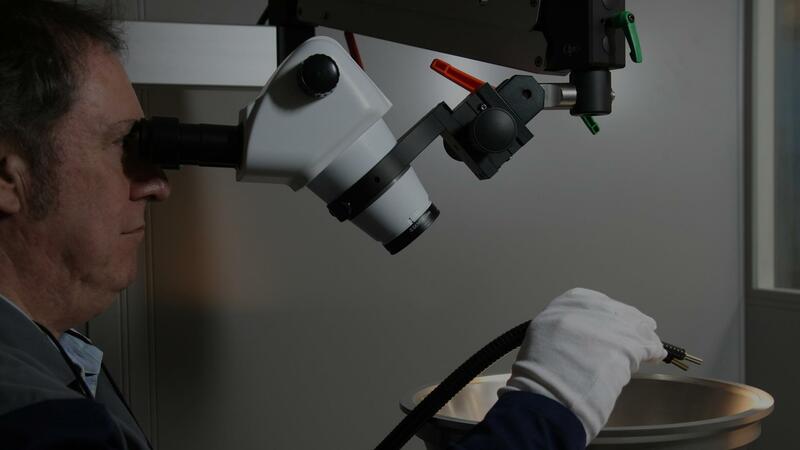 Amfin is proud of its experienced and meticulous inspection team - working from a dedicated inspection room using specialist optical equipment. Etching and Inspection of Nickel Based and Titanium Alloys (Critical and Sensitive) / Etching of Hardened Steel Components / Non-Destructive Magnetic Particle Inspection / Non-Destructive Testing Fluorescent Penetrant Inspection / Visual Inspection / Tactile Inspection / NDT Examination for Land Based & Marine Power Turbines & Related Equipment.